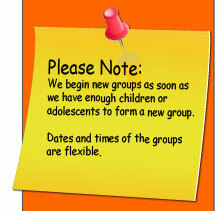 The Social Skills Group Play helps children and adolescents with their Social Skills. Why is play important for children and adolescents? What is play? To play is to engage in an activity that is fun. Play is to move or function freely within prescribed limits. The play I am referring to should involve at least one other person and the kids should not be planted in front of a television and/or a video game. Play involves JOY, the joy of doing something, a game perhaps or just “make believe”. Play can have an infinite number of variations. As long as everyone agrees, the rules of the game can be changed. Variations help children to try new experiences and to cope with their environment. Play has certain characteristics. 2. No clear purpose to the game. 3. The rules are flexible. 4. It evokes short lived emotional responses. Emotional responses do present during play. (e. g. Competitiveness, anger, fear, JOY, relief, A SENSE OF BELONGING, hope and expectations to name a few.) But the emotional responses are often reduced by the notion that "It is only a game." Play is a way children can learn to deal with tensions and frustrations constructively. Children need to create their own experiences and conflict resolutions, and they can do this through play. At the Social Skills Place, Inc. The children become part a small group of young people. We work on skills in a structured environment and we practice them together, but we also include play every group session. We practice our newly learned skills and have fun. In addition we talk about how we feel and the children learn a new way to express how they feel besides acting out. It is important to allow your children to invite friends over to your home and just let them PLAY. Of course children need supervision which means an adult who is near by to oversee that the play is going well for them. Until a child or young person is an adult they need our personal involvement in their lives. They need our encouragement and our supervision to make sure they are making good choices for themselves. The Social Skills Place, Inc. wishes you a healthy and a Happy New Year 2007. This year be the best parent you can be, and your child will be the best child they can be. Life is reciprocal. Make it a good year. Some ideas taken from: by Bernie Badegruber2002. 101 Life Skills Games for Children.